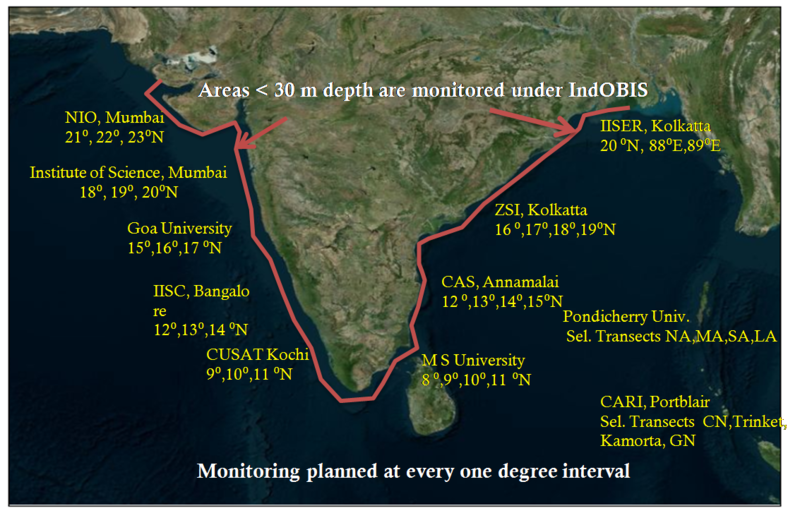 IndOBIS collects data sets of occurrences of identifiable marine species at a specific time and place collect edmainly in the Arabian Sea, Bay of Bengal and the Indian Ocean. It is one of them or ethan 20 regional nodes of the Ocean Biogeographic Information System OBIS. IndOBIS supplies the global scientific community with various types of geo referenced information on the biodiversity of Indian Ocean. CMLRE, as the Nodal agency, integrate and collate information from sources that lie scattered among several agencies, institutions and individuals within the Indian Ocean region. The near shallow waters of coastal belt (from intertidal to 30 m depths) of the Indian EEZ, which cannot be surveyed using FORV Sagar Sampada, is being studied with the active participation of several maritime universities and institutions. Beyond the 30 m depth zone, data will be gathered through FORV Sagar Sampada cruises by CMLRE. IndOBIS thus contains species occurrence data on habitat level as data bases which include inter alia variety of spatial querying tools for visualizing relationship among species and their environment.